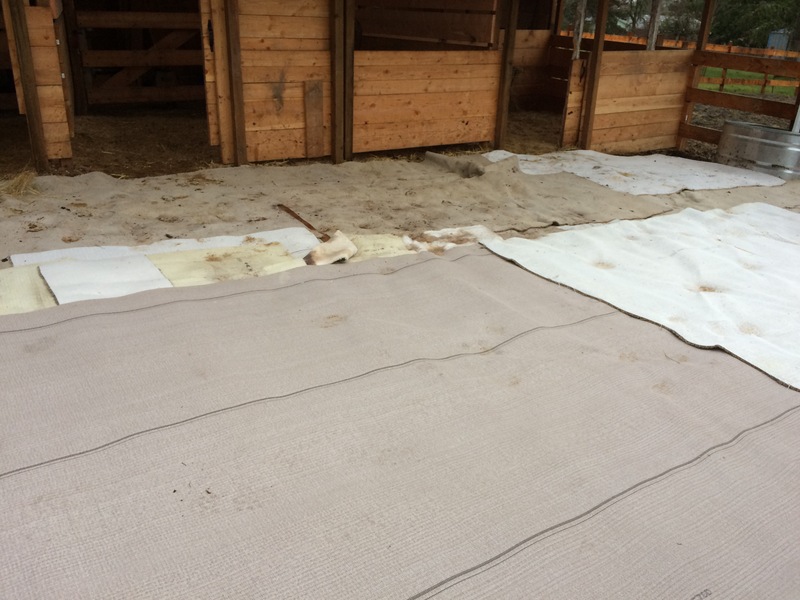 How many layers of carpet does it take to keep my horses feet out of the mud? My sister Cheryl and I were having a conversation yesterday about why we tend to do things in unconventional ways. Why don’t we just do things the way “normal” people do? We think it stems from the necessity of having to figure out alternative ways of doing things as we were growing up due to lack of money. I remember trying to make a saddle for my pony out of burlap bags and twine because I couldn’t afford a saddle. I also tried to fence in our backyard with pallets because we couldn’t afford a fence and there were some old pallets sitting back there. The only reason I was able to even have a Shetland pony and later a Morgan/welsh filly was because people in the neighborhood allowed me to keep my animals on their property for free, and I was able to buy them and pay for their food with my babysitting money. Fortunately, they both stayed healthy and I don’t remember having to deal with any thrush. I trimmed their feet myself and don’t remember ever trimming their frogs but they always looked normal and never overgrown or smashed flat. Maybe angels came and took care of that for me, I don’t know. Dealing with the horses foot thrush I concocted the idea of carpeting the corral. 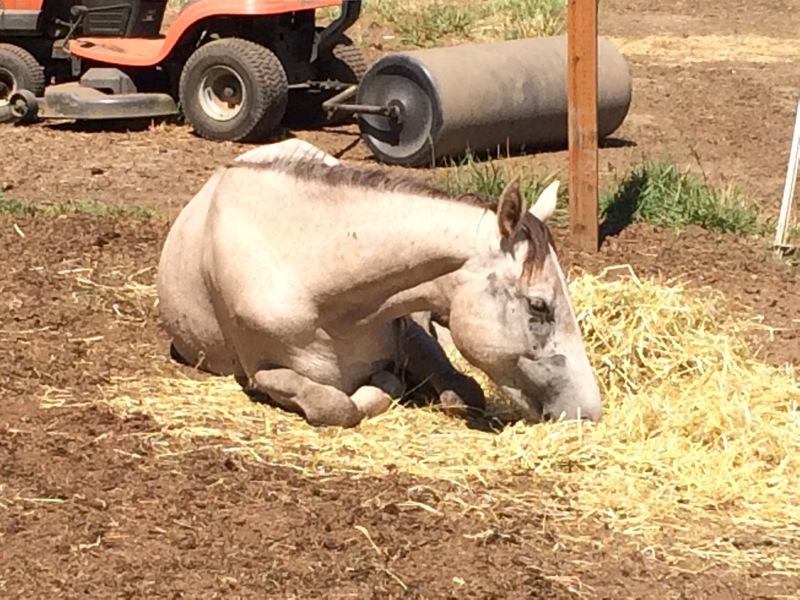 The first layer got stepped on by the heavy horses and created empty little pockets pushed down into the mud. 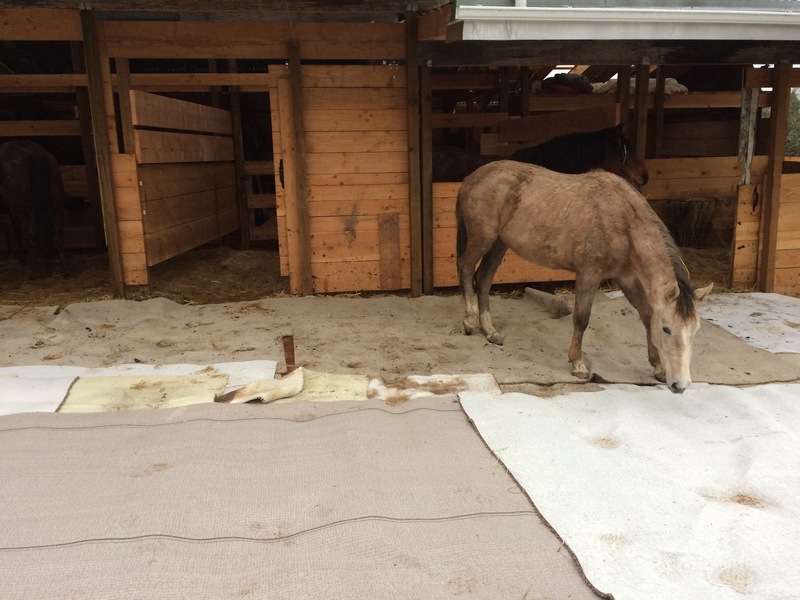 For the second layer, we found some large carpets being torn out of a business and having two layers worked much better but still, the hooves were creating pockets being pressed down. Today I brought some more old carpet given to me out of a dumpster and laid down a third layer. Unfortunately the pieces weren’t as large so they tend to get moved around a bit. We’ll see what it looks like tomorrow! I would think that with enough layers the horses feet will stop making pockets in it! Hey see that certainly is curious about The carpets though. She really examines them when she first walks on them. Horse tales . . . Or maybe I should say horse tails. When I got my Missouri Foxtrotter’s, they’re gorgeous long tails were so matted, the centers of their tails were big fat dreadlocks. 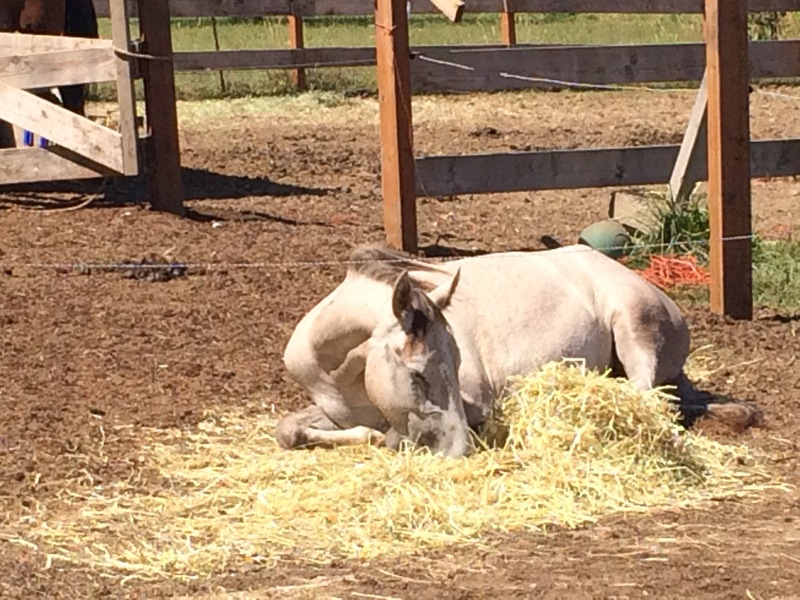 We have all three horses baths last summer and began working to untangle and comb out the two Foxtrotter’s tails. I could see it would not be easy. 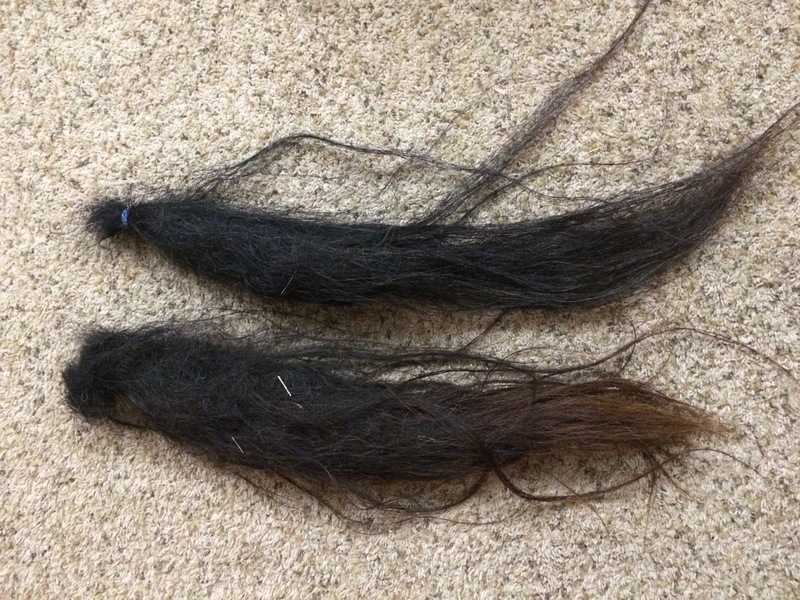 When our new Ferrier came to trim their feet, she said she would just cut the dreadlocks out. I decided to do that. I cut them out and quickly regretted it when I saw them lift their tails. The long side tendrils hung down and the stubs from the cut off dreadlocks stuck up like weird looking bobtails. I gave the cut off dreadlocks to my sister Krista, who would use them in her pottery. I guess when you put horse hairs in pottery when you fire them they make interesting patterns. 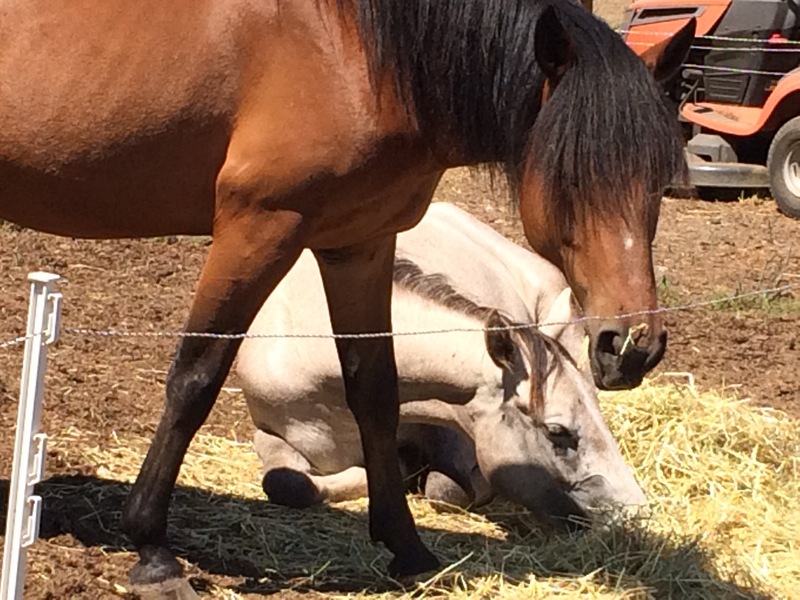 But I always felt bad when the horses tried to switch their tails at the flies and were so ineffective. One day when I was in the saddle shop I saw some long hairs hanging on the wall, held together with rubber bands here and there along the length, that looked kind of like a horse tail. I asked the owner what that was and he said it was horse hair extensions! He said, “Yes!” And smiled, kind of amused as my mouth fell open. Then I had an idea. I decided to get the tails back and reattach them if I could. I think super glue would work. I’ll let you know how it goes. Here’s a picture of the tangled tails I got back from my sister. I’m going to try to get them all slippery with water and conditioner and see if I can untangle them first. I’ll keep you posted on this project.